Safety Switch testing. Or as you heard us say, RCDs. As part of the operating time / current test (or Tripping Time: TT) regiment, the fixed RCDs are also Push Test (PT) activated on intervals as described by all relevant standards including Work Safe Queensland. This means 6 monthly interval PT activation for offices by us before leading up to the Tripping Time (TT). That's a long time before we revisit to ensure the safety switch is working within its maximum TT. So it is important to PT activate the fixed RCDs as part of the program. Most relevantly, our clients are actively encouraged to PT activate the fixed RCDs 3 monthly as part of their workplace safety program (that's 4 times in a year, but they save lifes!). The reason and importance for this cannot be encouraged enough as seen recently by the efforts put out by the ESOQLD. ESO safety switch campaign. Have you seen the ads on TV? Electrical Safety Office Queensland @ESOQLD has been actively releasing campaigns on both TV and radio of a girl and her dolly's house. ESOQLD are encouraging homes to have Residual Current Devices (RCDs) or safety switches to be installed not only on General Power Outlets (GPOs) but also on all electrical circuits including lighting circuits. If your business does not currently have any safety switches, all electrical items need to be tested and tagged. In keeping with the expectations of ESOQLD, your business should consider installing safety switches. They've included a section called "Playing it Safe with Safety Switches" which includes two very informative videos that can be very useful for businesses to recognise and adopt as a basic part of every business WHS electrical standard. "Busting the myth: Safety switches and circuit breakers" shows you how to identify all the switches in the switchboard and distinguish all others from the safety switches. When we quote new business clients for RCD testing, they send us pictures of their switchboards for us to see if they are RCD protected. The video does show you quickly how to identify if your switchboard has safety switches immediately. "Testing your safety switch" shows how you can Push Test (PT) activate your home's safety switches which can be used in businesses too. Both AS/NZS3760:2010 and QESR recommends testing fixed RCDs (safety switches on the switchboards) to a minimum of 6 monthly by user. Manufacturers of safety switches would recommend a monthly or 3 monthly interval PT activation by user. Pictures below shows two of these stickers found on a client's switchboards that illustrates the manufacturer's recommendation. *Apologies for the grainy picture. 1st diagram illustrates a push button activation of the RCD for the calendar year Jan, Feb, March. We TT and PT, but you can PT too. As emphasized in the "Testing your safety switch" video, not only is having RCD in your home important but also PT-ing the RCD regularly is just as important to ensure it continues to work. Your home or business can choose either 1 monthly, 3 monthly, or 6 monthly push "Test" button activation of the Safety Switch. As the latest video from the Work Safe Queensland recommends, the 3 monthly PT interval is a great start to improving the electrical safety standard and reducing electrical risks in the house. The same is true for workplaces. We actively recommend our clients the practise of PT-ing the "T" button 3 monthly and see faster TT when we revisit office areas in 2 years. The only down side is, you have to reset the digital clock 4 times a year. A small down side. Kick-start this special event on this Easter long weekend at Bunnings Smithfield! Yes! It's complimentary Test and Tag for Bunnings PowerPass cardholders or sign up for the card online on the day to enjoy Bunning's Trade PowerPass member's benefits. Set your reminder to drop by the Timber Yard section at Bunnings Smithfield on the Wednesday, 23rd March 16 from 9am to 1pm, and SnapTag personnel will be ready to take in your electrical items for testing and tagging. as the affected part which is detachable from the power adapter(not affected). 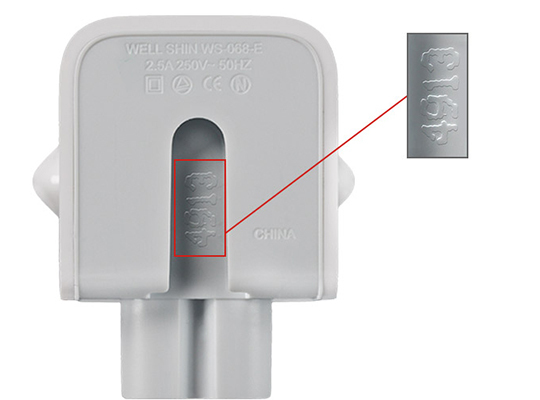 Apple has made a big announcement on safety concerns with AC Adapters that came with most apple products released from 2003-2015. Your apple ac adapter might look like a complete adapter by itself, but it has detachable parts as shown in the picture below. The back slot would have numbers or no numbers. Once you've identified the detachable two prong plug adapters, all that is needed is to get it exchanged. Simply by going to the Authorised Service Provider (One company registered for Cairns came up as Talk To The Mac with one at Grafton St in the city and Smithfield Shopping Centre) or have the replacements mailed to you. Dig up all the serial IDs for all your affected Apple AC Adapters, sign in to your apple ID, come to the end page that is clearly not up to speed with the Exchange Program, (giving instructions to send your perfectly fine Apple product to them as is with the case of a normal send by mail repair job), ignore the end page, receive an email few days later confirming the replacement part will be delivered. Meanwhile, if it looks unsafe; it probably isn't. Stop using it and stay safe. Yes! Its on Bunnings Smithfield. We'll be at Bunnings Smithfield offering FREE Test & Tag for Bunnings Trade PowerPass cardholders. If you haven't got one yet, you can sign up for the Bunnings Trade PowerPass Card FREE online now or on the day while SnapTag personnels attend to your electrical items for testing and tagging. Share this special trade event with your mates and give us a like thumbs up Google +1 if you think this is a great event!